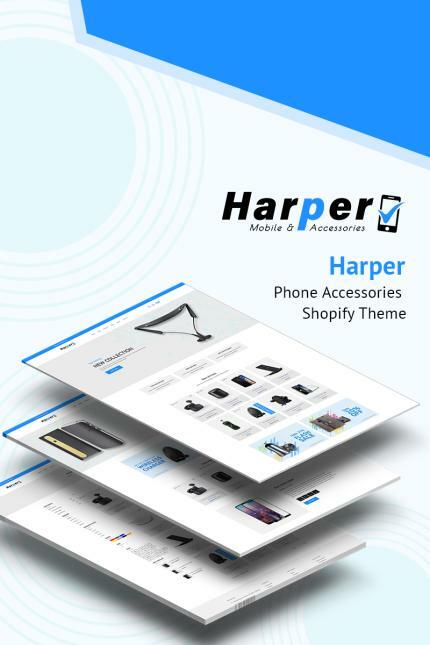 Harper - Phone Accessories Shopify Theme is a high performance Shopify theme, designed with aristocratic outfit. Harper is to build eCommerce website that sells the most trending and market leading products- Mobile Phone, Headphone, Sound Systems, Bluetooth Headphones, Screen Protectors, Catching, Power Banks and all other mobile accessories. However, Harper Responsive Shopify theme is a Cross-Browser Compatible demo website which provides- Quick Install Sections, Drag & Drop, Theme Color Options, Newsletter Popup, Multiple Currency, Dropdown Menu, MegaMenu, Slider etc. Your products are the main bridge between you and your customers. For the products there are options like- Featured Product, Product With Carousel, Ajax Cart, Built in Wishlist, QuickView, Breadcrumb Banner, Product Badge/Sticker, Product Details, Product Zoom, Product Popup, Shop Grid/List View and Collection Sorting. To connect and engage your clients more with your business there are Contact Form, Blog Sections, Product Share, Disqus Comment, Post Share and Post Comment etc. Don’t be tensed about the author’s convenience. We have added a smart 404 Page, Custom Page, Google Fonts, 15+ Pre-loader, Well Documentation and all other necessary functionalities for you. Keep trust on Harper and remain connected with us to have all your further queries, customizations and updates. ﻿Note: Images are not included.